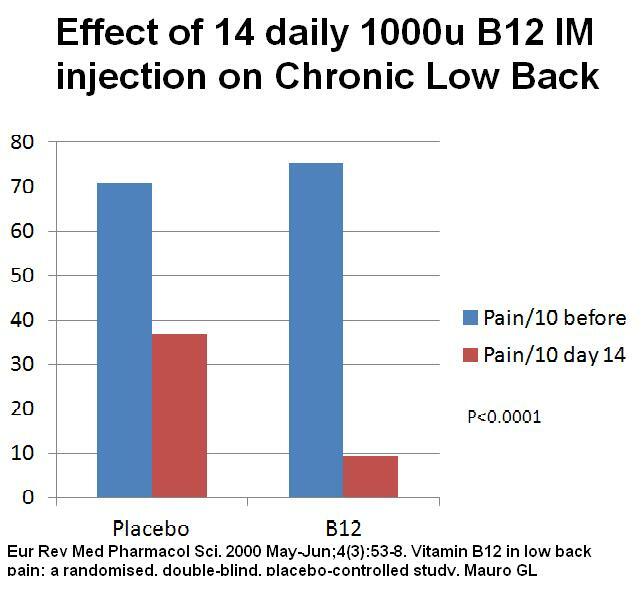 Double blind, randomised, placebo – controlled trial of daily 1000U IM/day B12 for 14 days found significant benefit for people with chronic Low Back Pain. Cochrane review thought it was not high quality but sounded good to me; and for a non-drug company sponsored study, there is probably no money to do a better one. This was written in 2000 and no one has probably heard about it. Eur Rev Med Pharmacol Sci. 2000 May-Jun;4(3):53-8. Shortening diclofenac therapy by B vitamins. Results of a randomized double-blind study, diclofenac 50 mg versus diclofenac 50 mg plus B vitamins, in painful spinal diseases with degenerative changes. Curr Med Res Opin. 2009 Nov;25(11):2589-99. Proc West Pharmacol Soc. 2004;47:92-4. Effect of diclofenac on the antiallodynic activity of vitamin B12 in a neuropathic pain model in the rat. Zh Nevrol Psikhiatr Im S S Korsakova. 2009;109(10):30-5. 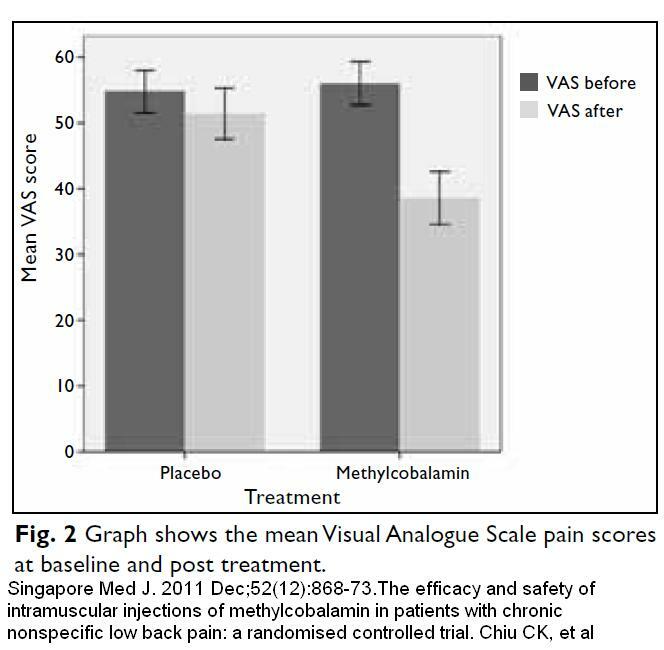 Vitamin B complex (milgamma) in the treatment of vertebrogenic lumbosacral radiculopathy. 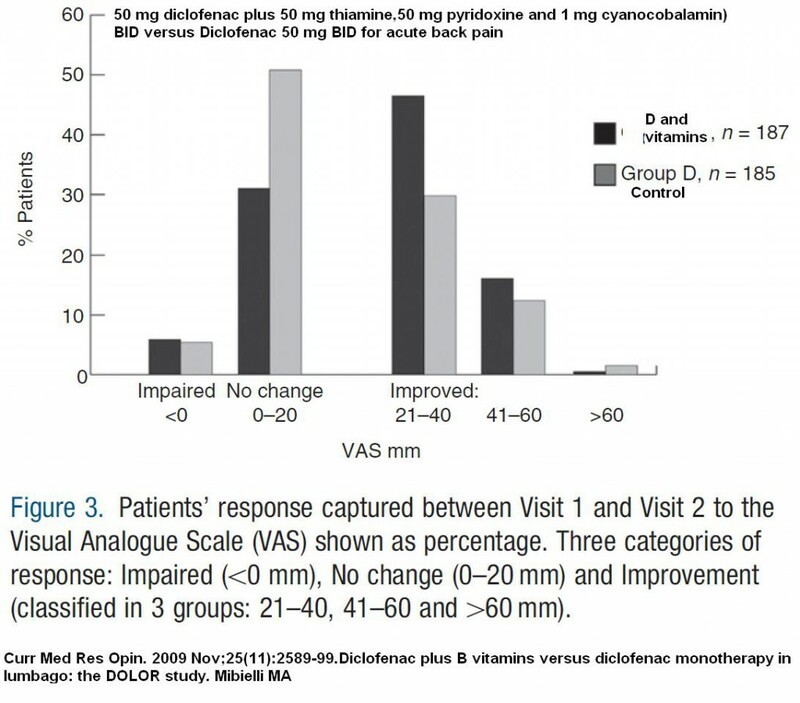 24 days – moderate or substantial improvement 66% patients on Vitamins and Diclofenac (Voltaren) versus 34% on Diclofenac alone. Comment – trust Cochrane to bury this – will have to try it and see for myself. Subcut injections would be easier for patient to give; can’t see it would make any difference vs IM. Int J Diabetes Dev Ctries. 2009 Jan-Mar; 29(1): 28–34. – They used B12 50,000 mcg three times daily for 12 weeks. Proc West Pharmacol Soc. 2004;47:76-9. Reyes-García G, Caram-Salas NL, Medina-Santillán R, Granados-Soto V.
B-vitamin Mixture Improves the Analgesic Effect of Diclofenac in Patients with Osteoarthritis: A Double Blind Study. constriction in rats and reduced capsaicin in vivo and in vitro effects. Kopruszinski CM(1), Reis RC(1), Bressan E(2), Reeh PW(2), Chichorro JG(3). Watanabe T, Kaji R, Oka N, Bara W, Kimura J.
Okada K, Tanaka H, Temporin K, Okamoto M, Kuroda Y, Moritomo H, Murase T, Yoshikawa H.
Akt/mammalian target of rapamycin signaling pathway regulates neurite outgrowth in cerebellar granule neurons stimulated by methylcobalamin. Authors: Waikakul S.1; Hirunyachote P.
Int J Audiol. 2004 Mar;43(3):162-5. 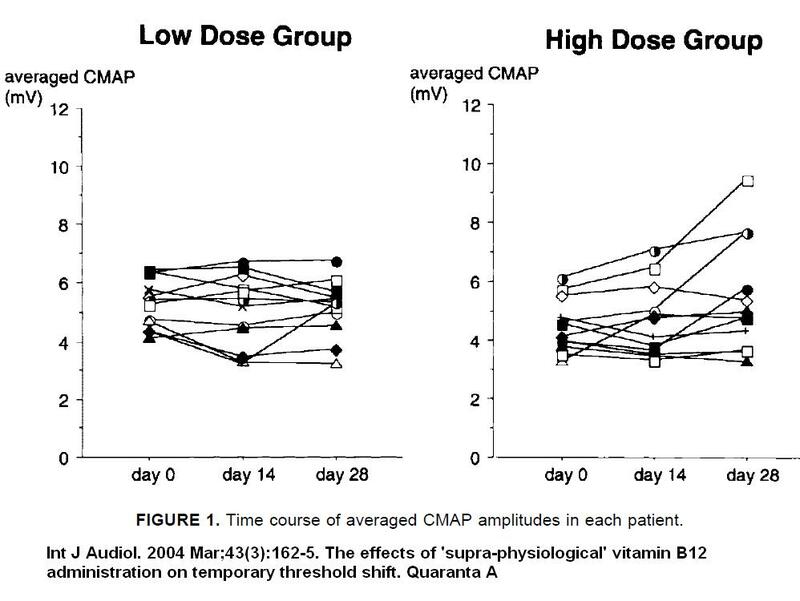 The effects of ‘supra-physiological’ vitamin B12 administration on temporary threshold shift. Ulta-high B12 doses seemed to help Amyotrophic Lateral Sclerosis (ALS) “averaged compound muscle action potential amplitudes (CMAPs)” in a double-blind trial. However, as you can see, it appears 3 outliers determined these results. They thought people with slower and longer-lasting disease could have been more responsive. 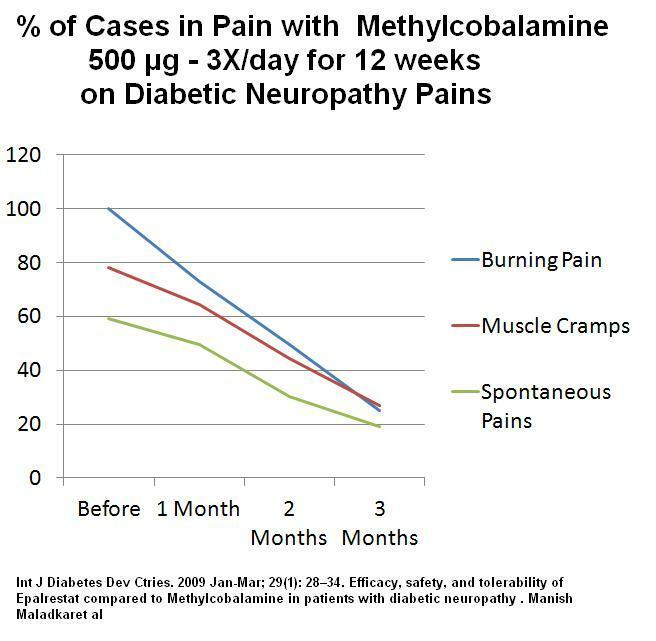 Clinical trials of ultra-high-dose methylcobalamin in ALS. J Spinal Cord Med. 2003 Summer;26(2):116-21. Vitamin B12 deficiency in spinal cord injury: a retrospective study. Treatment of persistent sleep-wake schedule disorders in adolescents with methylcobalamin (vitamin B12). Ohta T, Ando K, Iwata T, Ozaki N, Kayukawa Y, Terashima M, Okada T, Kasahara Y.
Sato Y, Honda Y, Iwamoto J, Kanoko T, Satoh K.
Effect of folate and mecobalamin on hip fractures in patients with stroke – a randomized control trial. This entry was posted in Back Pain, Deficits, Drugs. Bookmark the permalink.